Some baby-faced chefs, fresh out of cooking school, are looking to open a restaurant in Granford. They plan on using local foods-great news for city girl banker-turned orchard owner Meg Corey. Yet when one of the chefs is found dead, face-down in a farmer's pig wallow, plans come to a screeching halt. And Meg soon discovers they may have a locally grown killer on their hands. 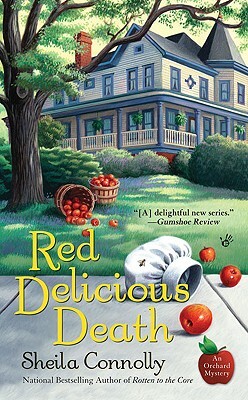 Sheila Connolly is the New York Times bestselling, Anthony and Agatha award nominated author of the Orchard Mysteries, the Museum Mysteries, and the County Cork Mysteries. She has taught art history; structured and marketed municipal bonds for major cities; worked as a staff member on two statewide political campaigns; and served as a fundraiser for several nonprofit organizations. Sheila also managed her own consulting company, providing genealogical research services. In addition to genealogy, she loves restoring old houses, visiting cemeteries, and traveling. Now a full-time author, Sheila thinks writing mysteries is a lot more fun than any of her previous occupations. She is married and has one daughter and three cats.